It’s not uncommon to see that people in New York City have left their marks on the side of a building … until you realize where that building is. The World Trade Center is undergoing a transformation, by way of street art. Bauvez calls his mural “Wild Things,” and dedicates it to his sister and mother who are fighting cancer. 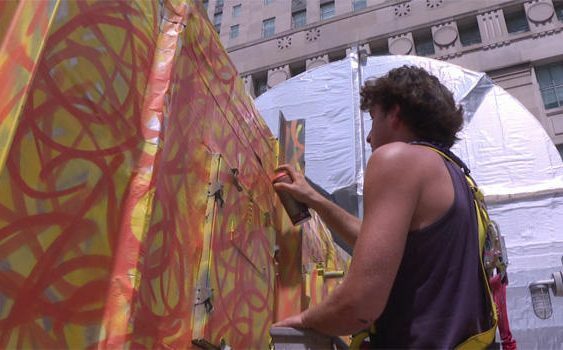 Street artist Dylan Bauvez at work at the World Trade Center construction site. All across this construction zone – more than 20,000 square feet of corrugated metal – every surface tells a story of mystery, acceptance, and love. One, painted by artists Chinon Maria and Sebastian Mitre, blooms audaciously in the shadow of the 9/11 Memorial. Its flowers suggest new life and hope. “You want to do something that honors the area, that brings hope, that brings life to a place that has gone through such tragedy,” said Maria. Flower-filled artwork by Chinon Maria and Sebastian Mitre. Reviving this site, one can of spray paint at a time, even from 30 feet in the air. The art project started when earlier this year the Port Authority of New York and New Jersey asked Silverstein to liven up his construction zone. “You could have hired anyone – why did you choose street art?” Salie asked. Velasco says graffiti emerged in New York City in the 1960s as a way for impoverished groups to find visibility, to literally make their mark in society. Turns out, graffiti goes way back. Velasco says that when Spanish conquistador Hernán Cortés was plundering the Americas in the 1500s, graffiti offered expression to his otherwise silenced soldiers. And closer to our own time, remember those pictures of New York in the 1960s, when impoverished artists quite literally used almost anything to make their mark? A movable canvas for 20th century New York artists. “It’s fascinating to realize that graffiti is sort of like an early version of social media: Hear me. I get to have a voice,” said Salie. And it’s social media, say artists Stickymonger, Boogie, and Todd Gray, that’s helping spread the popularity of this public palette. “The pictures that they take with it, they jump with it. The action, the motions that they give. It’s everybody’s artwork. We all made it together,” Boogie said. Still, for all the joy their art brings, the artists say they haven’t forgotten their canvas is hallowed ground. For all the joy this art brings to its audience, the artists will never forget the history of their canvas. “To have all these murals, to me they’re just these metaphors of wildflowers, just kind of growing through the rubble,” said Gray. Story produced by Robbyn McFadden.